Today we shall discuss a few multiple choice questions involving gravitation. The first question pertains to a simple binary star system. In a simple binary star system two stars orbit around their centre of mass under their mutual gravitational attractive force. The two stars constituting the binary star system need not be of the same mass. Note that Kepler’s laws are applicable to binary stars also. Click to see this. 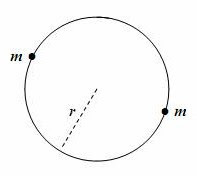 Gmm/(2r)2 = mv2/r where G is the gravitational constant and v is the orbital speed. 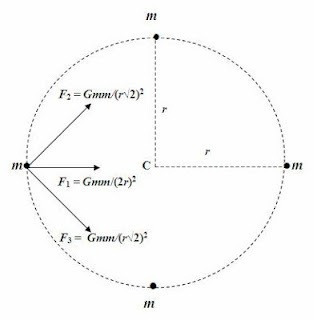 (2) Consider a multiple star system containing four stars of the same mass m arranged symmetrically and orbiting around their centre of mass C (Fig.) in the clockwise direction in a circle of radius r. What is the orbital speed of each star? Evidently F1 is directed towards the centre of mass C of the star system. F2 and F3 have equal components (Gm2/2r2)cos 45º directed towards the centre of mass C of the star system. 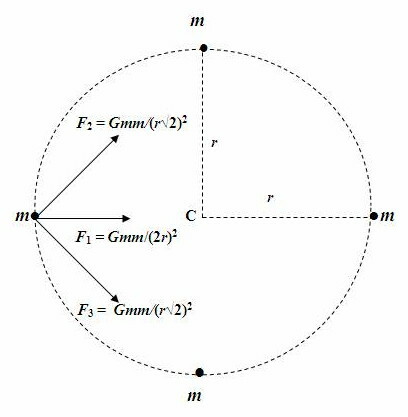 The net radial force acting on a star is therefore equal to F1 + F2 cos 45º + F3 cos 45º = Gm2/4r2 + (Gm2/2r2)cos 45º + (Gm2/2r2)cos 45º. This gives the orbital speed, v = (½)[(Gm/r)(1 + 2√2)]1/2, as given in option (d). (3) A particle of mass 4m is kept fixed at point P (Fig.) in the xy-plane. Another free particle of mass m at the origin is found to be unperturbed when a third fixed particle of mass 6m also is present in the xy-plane. If the x-coordinate and y-coordinate of the particle of mass 4m are –√2 and +√2 respectively, what are the x-coordinate and y-coordinate respectively of the particle of mass 6m? The free particle of mass m at the origin is unperturbed since the gravitational forces on it due to the fixed particles are equal in magnitude and opposite in direction. This can happen only if the three particles are on the same straight line, with the free particle of mass m in between the fixed particles. G(4m)m/22 = G(6m)m/r2 where G is the constant of gravitation and r is the distance of the particle of mass 6m from the origin. 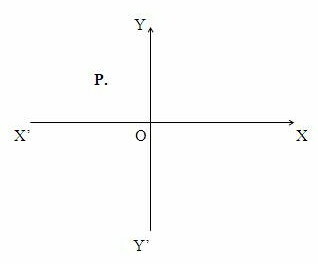 Since the particle of mass 6m is located in the 4th quadrant, its x-coordinate and y-coordinate are +√3 and –√3 respectively [Option (a)].